is a professor of biology at Tufts University. Her latest book is Silent Sparks: The Wondrous World of Fireflies (2016). She lives in Lincoln, Massachusetts. Myriads of fireflies dart from either bank, to meet and cling above the water. At moments they so swarm together as to form what appears to the eye like a luminous cloud, or like a great ball of sparks. Sometimes, when many fireflies gathered together, they all glowed slowly on then off again in unison, as if the air itself was breathing. Yet within just a few decades, these beloved insects would be nearly extinguished from the Japanese countryside. Best-known among Japan’s 50 different firefly species is the Genji firefly, Luciola cruciata. With its fast-flowing rivers and streams, Japan provides ideal habitats for this firefly, whose life cycle is intimately tied to water. Females lay their eggs along mossy riverbanks, and newly hatched larvae crawl down into the water. As juveniles, these aquatic fireflies spend several months underwater, feasting on freshwater snails. Eventually, the young fireflies crawl back onto land, before metamorphosing into the familiar adults. As forerunners of early summer, Genji fireflies’ lime-green lights float silently over the water, mysterious and otherworldly. Why did they fade away into glowing ghosts? Although Japanese fireflies faced many hazards, perhaps the most destructive was overharvesting, followed by habitat degradation. During the Meiji period (1868-1912), the popular summer pastime of firefly-watching segued into commercial firefly harvesting. Live fireflies were in vogue, and people were willing to pay good money to enjoy their luminous beauty closer to home. Setting up shop in prime firefly locations, firefly wholesalers hired dozens of local firefly hunters. A single skilled hunter could bag up to 3,000 wild fireflies per night, working sunset to sunrise. In the morning, shop owners carefully packaged up the night’s catch and dispatched cages full of live fireflies to clients in Osaka, Kyoto and Tokyo, where the insects were released into hotel, restaurant and private gardens so that city dwellers might enjoy their brightly glowing show. Japanese fireflies, harvested for their beauty, were being loved to death. As the demand for live fireflies grew, wild populations began to decline. Apparently no one cared that, once harvested, adult fireflies survived only a week or two; when they died, they were just replaced with freshly harvested new ones. And apparently no one cared that firefly hunters indiscriminately harvested not just the males, but also the precious egg-laying females, thereby extinguishing the only hope fireflies had to replenish their own populations. At the same time, rapid industrialisation and urban development led to the degradation of the fireflies’ natural habitat, as industrial effluent, agricultural runoff and household sewage flowed freely into rivers. River pollution curtailed the survival of the aquatic juveniles, and killed off their snail prey. By the early 1920s, people took notice of the fact that firefly populations around Japan were thinning out. In response, the Japanese government in 1924 established the first National Natural Monument, providing legal protection for the Genji firefly habitat. Local communities undertook municipal projects to clean up their rivers, while commercial harvesting of wild fireflies was regulated, then banned altogether. Numerous private citizens attempted to raise the aquatic fireflies in captivity, using trial and error to coddle them through each life stage. Once these artificial breeding programmes determined how to rear large numbers of firefly larvae, they were reintroduced into rivers to bolster dwindling natural populations. While Japanese fireflies have never been restored to their former glory days, a predictably sad saga was transformed into a conservation success story by an impressive combination of national, local and private efforts. Now, Genji fireflies have become a symbol of national pride and Japanese environmentalism. So what lessons can the United States take from this Japanese tale? For nearly half a century, fireflies in the US were also harvested – this time, though, it was for their chemicals. Beginning around 1960, what’s now the Sigma-Aldrich chemical company of St Louis in Missouri extracted light-producing chemicals from fireflies that had been harvested from wild populations. Sigma enlisted thousands of collectors, across 25 Midwestern and Eastern states, to collect and process more than 3 million fireflies every summer. After extracting the firefly chemicals, the company marketed bioluminescence kits that were widely used in medical research and food-safety testing. Fortunately for fireflies, in 1985 scientists developed synthetic versions of these chemicals that are both cheaper and more reliable, obviating the need to harvest wild fireflies. Yet near Oak Ridge, Tennessee, a mysterious gentleman named Dwight Sullivan was, even as recently as 2014, still paying collectors who harvested more than 40,000 wild fireflies that summer. North America has more than 120 different firefly species. Some are abundant and widespread; others are rare, with restricted distributions. Surely we have plenty of fireflies! I suppose the Japanese thought so, too. And US fireflies are also threatened by habitat degradation, as well as by light pollution and pesticide use. The first lesson is that fireflies are not an inexhaustible resource. We need to ban their commercial harvesting as an unjustifiable activity that exploits our shared natural heritage. The second lesson is the need for habitat protection, specifically where species of particular cultural, ecological or economic interest live. Worldwide, that includes not just the Genji fireflies of Japan, but also the congregating mangrove fireflies of Thailand and Malaysia, and the winter fireflies of Taiwan. Right now, firefly ecotourism for two distinctive US species is escalating: the unique Blue Ghost fireflies (Phausis reticulata) found in DuPont State Forest in North Carolina, among other places, and the synchronous fireflies (Photinus carolinus) of the Great Smoky Mountains. Japan has now designated 10 national monuments around the country that legally protect firefly habitats. In both Thailand and Malaysia, firefly sanctuaries have recently been established along mangrove rivers to safeguard prime sites for firefly ecotourism. 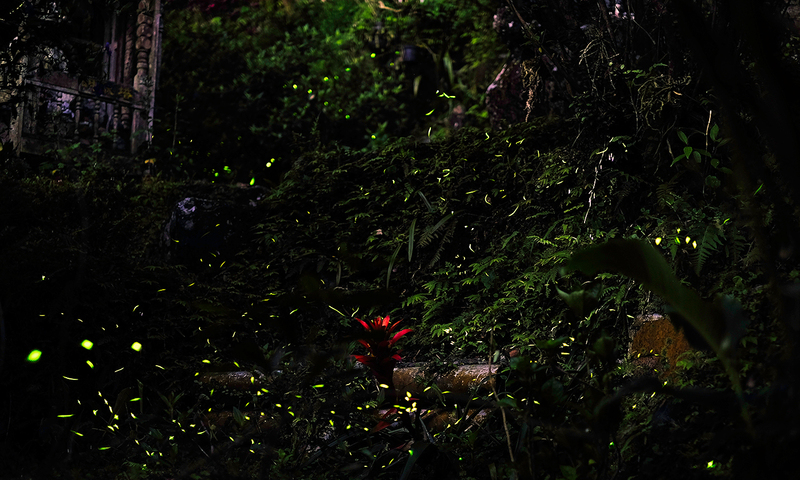 In Taiwan, two firefly species enjoy legal habitat protection. In 2014, China set up a firefly preserve outside of Nanjing. Yet in the US, fireflies have no special protection. If other countries can do it, why can’t the US – proactively setting aside just a few places where fireflies now thrive? Working with local, state and national conservation organisations, we can start by establishing firefly sanctuaries and management plans for existing ecotourist sites. We could also identify and protect biodiversity hotspots known to support many different firefly species. We all dream about the kind of world that we want our children to inherit. Now is the time to work together to preserve for future generations these brilliant emissaries of nature’s magic. Silent Sparks: The Wondrous World of Fireflies (2016) by Sara Lewis is published via Princeton University Press.